Doctor Who hasn't just taught us how to save the universe — the British time-travel show has also lasted a fantastic 32 seasons. How did a little show about a man in a magic phone box achieve this feat? By changing its format drastically. Doctor Who is perhaps the most flexible show on television — even the magic phone box has been done away with, on occasion. The Doctor can go anywhere, and take on all sorts of problems — including how to tell a new story with a decades-old show. 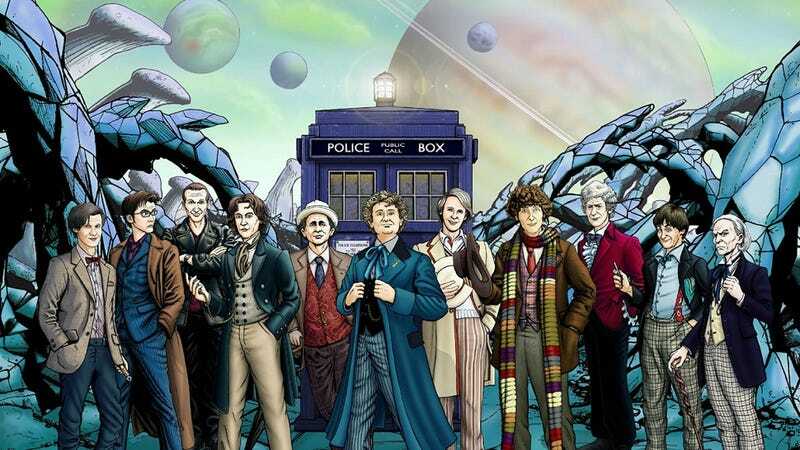 Here are ten totally different shows that Doctor Who has morphed into at different times. Top image: by Paul Hanley on Deviant Art. As originally conceived, Doctor Who was a cracking great adventure series for children — that taught some important lessons along the way. The Doctor was not nearly such a heroic figure in the early stories — and it's no accident that the main audience identification figures were a couple of schoolteachers and their young student. They could visit important historical figures like Marco Polo, and also go on science fiction adventures that would teach about science. Even after the show's educational mission got diluted by the success of the Daleks and other monsters, the historical adventures remained for a few years, and the scripts still often had a somewhat didactic feel. Doctor Who's fate as a monster-centric show was sealed as soon as the Daleks appeared. But as the 1960s wore on, the show became much more monster-centric — and claustrophobia became a much bigger part of the mix as well. (Partly, this was because Who got moved from the larger Riverside Studios back to the cramped, tiny Lime Grove Studio D, where sets had to be minuscule.) People sometimes refer to this as the "base under siege" era of Who — in many stories, there's a small base in a hostile location like the Moon or the South Pole, and monsters are trying to get in. But stories from this era also included monsters lurking in cramped tunnels, monsters entombed underground, and monsters hiding in ice caves. Just generally, think small enclosed spaces with monsters in them, or trying to get into them. At least, that's one way to describe the first few years of Jon Pertwee's tenure as the Doctor in the early 1970s. All of a sudden, the Doctor was elegant and debonair, like The Avengers' John Steed. He brandished lots of gadgets and got into fight scenes. And instead of flying around the universe, he drove around England solving local problems (which usually turned out to be aliens, or mad scientists.) The TARDIS was grounded by the Time Lords, and the Doctor joined up with a military organization under the United Nations, to save the planet from a nearly endless series of threats. The Doctor even got his first proper supervillain, the Master. As a result of the outcry over all that insane violence, the BBC made some changes in Doctor Who's production team, and all of a sudden the show was reborn as a light comedy. (There was sort of a transitional year, but the shift still feels fairly abrupt.) The Doctor got a robot dog, who became one of the show's main stars. Tom Baker, who'd been keeping his performance somewhat restrained, was encouraged to start taking the piss out of everything. Guest stars, too, were encouraged to ham it up. And the scripts got sillier and sillier — and that's before Hitchhiker's Guide to the Galaxy writer Douglas Adams was put in charge of scripts. At its best, you got the sublimely funny and demented "City of Death." At its worst... well, just watch the video. That's the best way I can think of to describe most of the Peter Davison era, which was suddenly totally earnest — but in a very different way than any previous era had been. The Doctor once again had a few companions, but he looked only slightly older than they were. The Doctor changed from an all-knowing, slightly pompous older man to a dashing young man who was frequently out of his depth but put a brave face on it. The supervillain from the early 1970s was back, but this time he was even more cartoonish, with an endless array of death traps and ludicrous schemes, bolstered by evil laughter and lines like "Oh, my dear Doctor, you have been naive." The Doctor braved danger in a supersonic airplane, in a racing yacht (in space), and on horseback, and still found time to play a spot of cricket in between. By the start of the Colin Baker era, the show had become both intensely silly, and extremely violent. Producer John Nathan-Turner had started producing pantomimes starring the Doctor Who cast, and many people feel that the pantomime ethos carried over to the show itself — including an alien pantomime horse, in one late Peter Davison story. The show's scripts were delving into more and more sadistic territory, with a post-regeneration Doctor trying to strangle his companion. For a few years, nearly every alien monster had to die by having its head melt, or by having green pus spurt out of every orifice. At the same time, the show's sets, costumes and performances were getting more and more garish and over-the-top. The result was stories full of cannibalism and acid baths, accompanied by day-glo costumes and shrill acting. Even after the show's nastiness was reduced, the campiness continued, with Brian Blessed trying to make everybody forget his "Gordon's Alive" line and Ken Dodd being, well, Ken Dodd. Something sort of magical happened in the final couple of years of the original series, mostly thanks to a new focus on the Doctor's companion, a punk anarchist named Ace. All of a sudden, the show was about the Doctor teaching Ace, and testing her. And she challenged the Doctor in ways no companion had before. We got to know some of her friends, and discovered what scared her most. Doctor Who became the story of Ace, and her heroic journey, with the Doctor as an untrustworthy, machiavellian mentor who often deceived Ace for (what he thought was) her own good. For the first time since the early 1960s, the Doctor was no longer the show's undisputed main character, and the stories explored themes like Darwinism and racism. The production values were worse than ever, but the sudden return of intelligent storytelling and a new character-based focus more than made up for it. When Russell T. Davies brought the show back in 2005 — and yes, we're just going to skip the TV movie — he was clever enough to create a whole new backstory. Not by rewriting the show's history, but by adding a new layer. All of a sudden, the Doctor was the last survivor of a terrible war that had wiped out his entire race. The Doctor suffered from survivor's guilt and PTSD, until a young Earth woman helped him to begin rediscovering his connection with humanity. And even though this theme was downplayed somewhat in Davies' later seasons, it still informed the Doctor's relationships and gave him a greater emotional fragility, culminating in a story where the Doctor is willing to give his own life to keep the war from starting all over again. It was probably inevitable that a resurrected Doctor Who would be more character-oriented and arc-driven than the original series, but Davies managed to reinvent the show's mythos in a way that opened up a lot of scope for new drama. When Steven Moffat took over as showrunner from Davies, the show didn't seem to change that much — at first. But by now, it's clearly a very different animal than it was a few years ago. Far from being the story of the Doctor's largely Platonic relationship with one Earthwoman (and then another, and another) Moffat's Who has evolved into the story of two interconnected romantic relationships. The Doctor's companion, for the first time, is married and has a child — who appears to be the Doctor's future love interest. All of a sudden, instead of the Doctor keeping his companion at arms' length while working through his unutterable loneliness, the Doctor has a time-crossed relationship with the worldly, dashing River Song. A lot of the show's focus is very much on these ongoing relationships, with the alien menaces becoming entangled with them rather than being a separate, outside threat. At the same time, the show has become both funnier and more overtly horror-focused than at any time since the 1970s. And the show's the most serialized it's ever been, with several long-term mysteries simmering in the background since the beginning of Moffat's era. What sort of show will Doctor Who be next? What format will it have ten years from now? Or fifty? We can't wait to see!